It can be irritating when someone who is not "in the know" interferes just because he has a title. I have done this more than once over the years, and I try to guard myself. I like to interfere. It is my anti-spiritual gift. A business owner decides to take a tour around his business and see how things are going. He goes down to the shipping docks and sees a young man leaning against the wall doing nothing. The owner walks up to the young man and says, "Son, how much do you make a day?" A few minutes later, the shipping clerk asks the owner, "Have you seen the UPS driver? I asked him to wait here for me!" Moses felt like an interferer. who had failed and bitten off more than he could chew. He had apparently tried to begin a movement to free to the Hebrews (Acts 7:25), but they did not respond to him. After killing an Egyptian, he had to flee Egypt for his life. Main idea: Happenings on earth are not unknown to God in heaven; God intervenes in His own good time. Moses Welcomed by Jethro (15b-20) read text through vs. 25. Ancient Midian (probably about 250 miles journey). This will become a big issue later on when we talk about the Real Mt. Sinai and its location in Saudi Arabia. 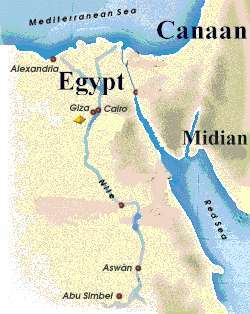 Egyptian territory went as far as the Red Sea. Moses intervenes in another case of injustice. Moses was intimidating to these other shepherds in his Egyptian garb. He must have been pretty tough looking to scare the other guys away. The Middle Easterners were big on hospitality and treating strangers well. It would not be an uncommon thing for these gals to invite Moses home to meet the family and stay overnight. Moses meets Jethro, aka Reuel. Called a priest (as well as a shepherd). An organizational genius who would help the nation of Israel get organized. Who was Jethro? Who were the Midianites? Genesis 25:1-2 reads, "Abraham took another wife, whose name was Keturah. She bore him Zimran, Jokshan, Medan, Midian, Ishbak and Shuah." Midianites: In the Bible, the Midianites are described as worshipping a multitude of gods, including Baal-peor and the Asherah. This belief in Yahweh and circumcision were handed down from Abraham. But the Midianites had added other gods to their religious beliefs and were probably a Henotheistic people (as opposed to monotheistic). Exodus 18:9-12, "Jethro was delighted to hear about all the good things the LORD had done for Israel in rescuing them from the hand of the Egyptians. He said, 'Praise be to the LORD, who rescued you from the hand of the Egyptians and of Pharaoh, and who rescued the people from the hand of the Egyptians. Now I know that the LORD is greater than all other gods, for he did this to those who had treated Israel arrogantly.'" The religion of the Midianites was a precursor to Zoroastrianism, a monotheistic religion similar to Judaism, that swept much of Persia and parts of India -- and still exists today. They produced a group of men called Magi, and the founder of the Magi was said to be the prophet Balaam whom we will encounter later. He was hospitable and warm. He did not reject someone just because he was different. They do not want to be friends with someone unlike them...instead of finding a few points of convergence, they want a lot of convergence. I have friends who share a common faith; I have friends who are part of our dance club; I have friends who hold different political views from me (although people are getting so rude and rampage-like about politics these days, it can become difficult); friends who are older, friends who are younger…. Fourth, when an issue comes up, they do not assert themselves gently. Moses Settles in Midian (21-22). Jethro may have had no sons. He took a liking to Moses. They were related 400 years back. Moses settles down in Midian. He had a lot to process.... He had failed to deliver his fellow Hebrews, a broken man living in exile. Do you allow yourself time to process loss, grief, & disappointment? Do you allow others that time, or try to cut it short in the name of faith? Life must have seemed sedate; but that is what Moses needed. No longer the man of "action". No longer "mighty in word". No longer thought of himself as the deliverer of his people. He was Moses the failure, Moses the has-been, Moses the man who blew it. What he names his sons shows us his thinking. Had no sense of "home" (2:22). Recognized his father's God (18:4) Eliezer. God Goes Forward With His plan (23-25). The Pharaoh died: God always wins the time game. God can "wait out" anyone; He will always win the time game. Most of us can understand how short periods of misery can draw us closer to God; but what about those long times? God does not change his timing. He announced His plan beforehand in Genesis 15:13-14: "God said to Abram, 'Know for certain that your descendants will be strangers in a land that is not theirs, where they will be enslaved and oppressed four hundred years. But I will also judge the nation whom they will serve, and afterward they will come out with many possessions.'" God's ways are indeed mysterious; but His character and nature - into which we are anchored securely - are completely dependable. In the end, all things work together for good - to them that love God. God's plan goes forward - in His time and in His way.